Mumbai: Rating agencies came under the spotlight following a series of defaults at Infrastructure Leasing & Financial Services Ltd (IL&FS), triggering liquidity concerns among non-banking financial companies (NBFCs). Shares of rating agencies were punished by the stock market for not being able to get a whiff of the financial trouble brewing at IL&FS. Since 21 September, which is when the IL&FS news broke, shares of Crisil Research Ltd, Care Ratings and Icra Ltd have lost 11.28%, 12.37% and 10.28%, respectively. In the same period, benchmark BSE 500 index has fallen 5.19%. Interestingly, these stocks were not fetching mouth-watering returns even before this event unfolded. In fact, in the previous year as well, their performance wasn't impressive. In 2017, Crisil declined 15.3%, Icra slipped 1.17% while Care rose 1.89%. During the same span, the BSE 500 index surged close to 36%. According to some analysts, after the recent event surrounding IL&FS, the Street’s sentiment towards these stocks has turned sour. But from an earnings perspective as well, there isn’t much for investors to look forward to. For instance, higher other income on the back of rupee depreciation helped Crisil beat analysts’ estimates in the September quarter. However, brokerages do not appear to be confident about the company’s prospects. “We see growth headwinds across ratings and non-ratings businesses, and this along with little room for cost rationalization would keep earnings under pressure. The ratings sector had re-rated on hopes of deepening bond market and revival in bank credit, which looks unlikely in the near to medium term," Elara Capital said in its earnings review report. The broking firm has downgraded the stock to “reduce" from “accumulate" and lowered the target price to ₹ 1,644 from ₹ 2,014. Sharing similar concerns, Edelweiss Securities Ltd said, “We believe bond markets will remain lacklustre and would thus continue to offset the positive impact of growth in bank loan ratings. Further, research is facing headwinds from maturing regulations." 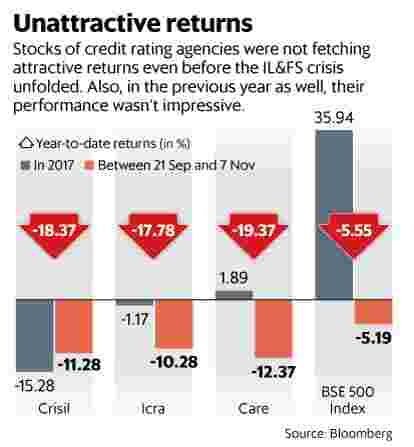 For rating agency Icra, the September quarter was a muted one. Its rating segment revenue grew at around 1% from a year earlier, and this stands against 1% decline in rating revenue for Crisil in the same quarter, Axis Capital pointed in its report on Icra dated 1 November. “Management highlighted tough operating environment with adverse yield movements and investment activities remaining benign despite positive policy measures by the government," Axis Capital analysts noted. However, they rated the stock a “buy" citing around 12% revenue CAGR (compounded annual growth rate) from fiscal year 2018 to 2021 and most of free cash flow to be distributed back to shareholders in the form of dividends and buybacks. Care Ratings, too, did not have a report card to cheer about. Consolidated total income for the half year ended September was little changed at ₹ 168.66 crore, while net profit fell by 14.7% to ₹ 70.63 crore from a year ago. “The fructification of the consumer demand story this year combined with pickup in private investment and resolution of the liquidity challenges witnessed of late along with stability in the forex market would hold the clue to future economic growth and, hence, the prospects for the rating industry," Rajesh Mokashi, managing director and chief executive officer of Care Ratings, said while announcing the firm’s earnings. “We would be cautious about outlook for the second half of the year, which against this backdrop, poses some challenges," added Mokashi. Meanwhile, in a report on 22 October, ICICI Securities said it is dropping coverage on Care Ratings stock citing concerns on increased vigilance of rating agencies by regulators in the wake of IL&FS fiasco. “Owing to such medium-term growth concerns, we believe earnings traction would continue to stay subdued. We are dropping coverage on the company. An upturn in the capex cycle and development of the bond market is required for healthy rating revenue traction ahead," the report said. With uncertainty at the fore, the outlook for ratings industry stocks looks muted in the near term.